Most of us know about the benefits of guava as a fruit. But did you know that guava leaves have several medicinal properties and offer an array of skincare benefits? Here are some of its benefits listed below. Acne and black spots can be quiet annoying and can adversely affect the look of your skin. Guava leaves effectively eliminate acne and black spots from the skin, as they contain an antiseptic that can kill acne-causing bacteria. All you need to do is, crush some guava leaves and apply it on the acne and the dark spots. Keep it for some time and rinse it off with water. You can do this daily until the skin is clear. To treat blackheads, blend the guava leaves along with a little water and use it as a scrub on your nose to remove the stubborn blackheads. Guava leaves contain antioxidants which help to eliminate the free radicals that damage your skin and protects it from aging. It also helps to improve skin tone and texture. 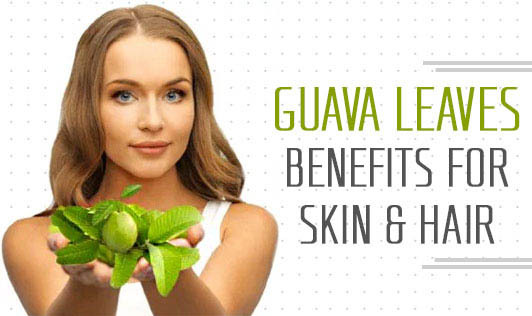 A decoction of mature guava leaves can be used to tighten the skin. Skin itching can cause a serious problem if not treated instantly. Guava leaves are an immediate cure for itchiness as they contain allergy blocking compounds. Guava leaves promote hair growth as they are rich in a variety of nutrients and antioxidants. To prevent hair loss, boil a handful of guava leaves in a liter of water for about 20 minutes, cool, apply it on your scalp and massage.